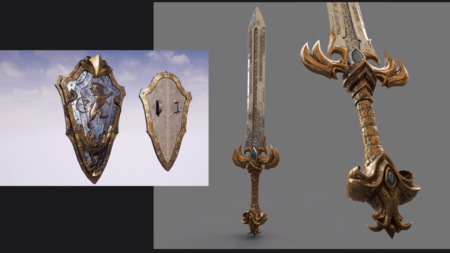 Tank Sword concept (by Michael Bacon) and Shield concept (by Javier Perez). 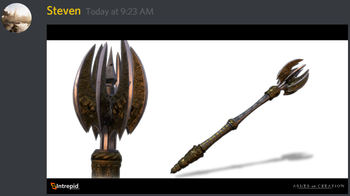 Polearm concept by Michael Bacon. 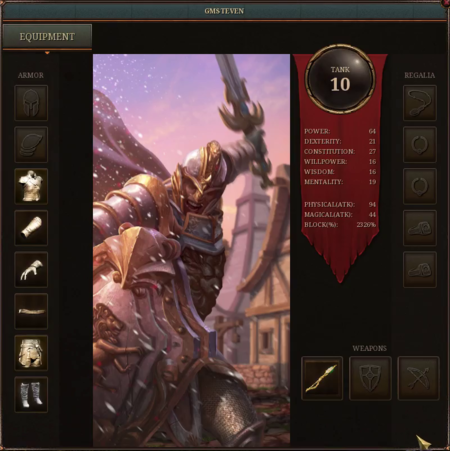 Weapons will determine a player's damage output alongside other conditions and stats. 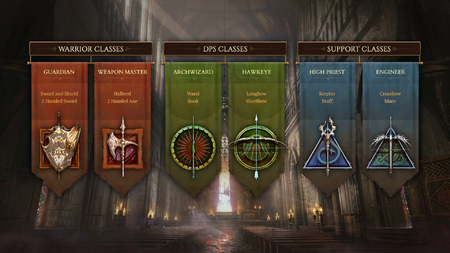 There is an even split between melee and ranged weapons. Axes (One and two handed). 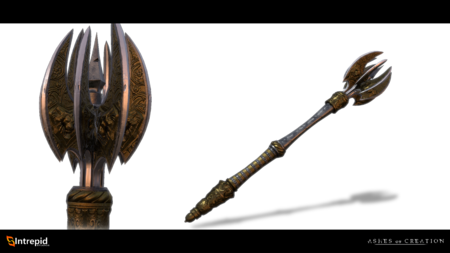 Maces (One and two handed). Swords/Rapiers (One and two handed). 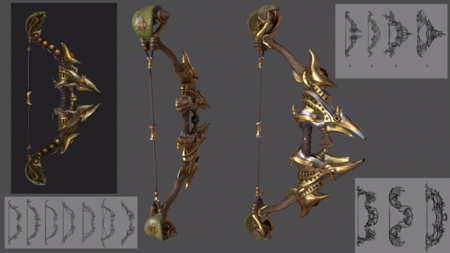 Pre-alpha Ranger bow modeled by Jon Arellano and concepted by Jeff Delierre. 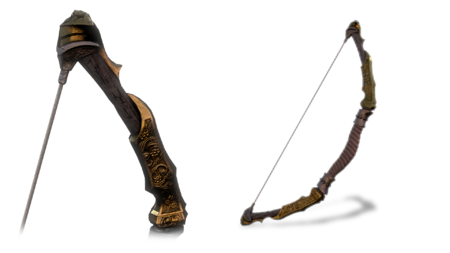 A character may equip up to two hand weapons and also wear a ranged weapon on their back. 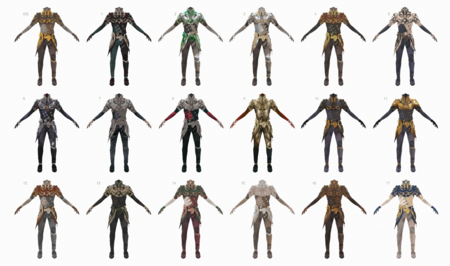 Characters performing ranged abilities will switch to the ranged weapon, then can switch back to the melee weapon and shield or two-handed melee weapon. 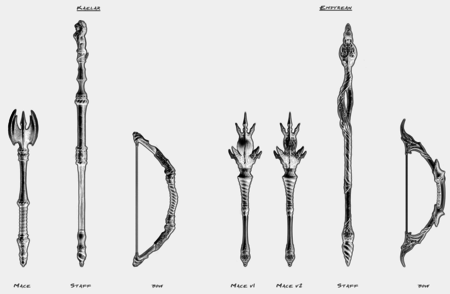 Rangers are going to have a minimum distance requirement where they are eligible to use their ranged weapons. Classes with a Summoner secondary may grant augmented skills that summon weapons. These summoned weapons are not able to be equipped. The word "equip" only applies to items. 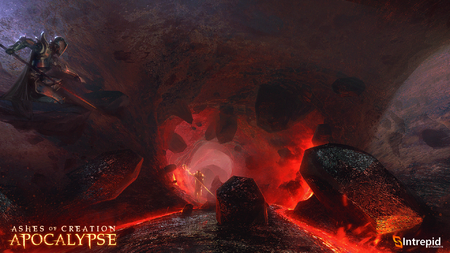 There are currently no plans to include summoning items into a player's inventory or character slots. 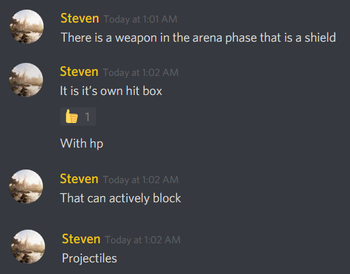 It may however be possible to change the appearance and damage type/data of a weapon through the use of a spell. 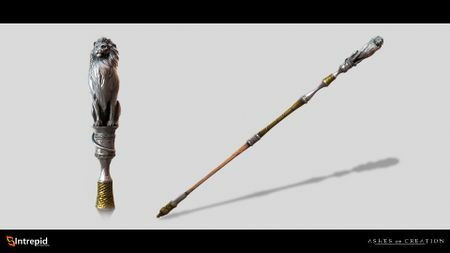 There are summoned weapons that appear as a spell VFX to damage opponents for a period of time. 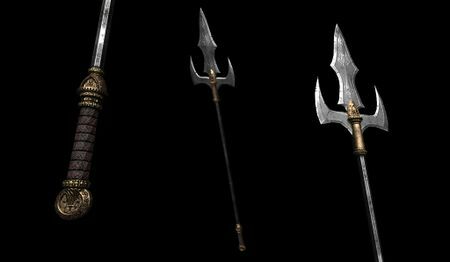 These will not be able to be wielded, since weilding implies an item in a character equipment slot. ↑ Livestream, 30 June 2017 (27:05). ↑ 4.00 4.01 4.02 4.03 4.04 4.05 4.06 4.07 4.08 4.09 4.10 Livestream, 24 May 2017 (14:15). ↑ 6.0 6.1 Livestream, 4 May 2018 (33:56). ↑ Livestream, 4 May 2018 (33:27). ↑ Livestream, 24 May 2017 (18:40). ↑ Livestream, 15 December 2017 (59:49). ↑ 16.0 16.1 16.2 Livestream, 4 May 2018 (45:37). ↑ 19.0 19.1 19.2 19.3 Podcast, 4 August 2018 (53:43). ↑ 20.0 20.1 20.2 Podcast, 4 August 2018 (55:17). ↑ 21.0 21.1 Livestream, 27 September 2018 (22:02). ↑ 23.0 23.1 23.2 Interview, 20 October 2018 (2:24:21). ↑ Interview, 17 August 2018 (6:03). ↑ 46.0 46.1 46.2 46.3 46.4 Interview, 11 May 2018 (16:32). ↑ 47.0 47.1 47.2 Livestream, 30 June 2017 (47:14). ↑ 55.0 55.1 55.2 55.3 Interview, 17 August 2018 (17:57). ↑ 56.0 56.1 56.2 56.3 56.4 56.5 Livestream, 4 June 2018 (1:11:19). ↑ 57.0 57.1 57.2 February 8, 2019 - Questions and Answers. ↑ 58.0 58.1 Livestream, 4 June 2018 (21:37). ↑ 64.0 64.1 64.2 64.3 64.4 Interview, 17 August 2018 (6:53). ↑ 66.0 66.1 66.2 Livestream, 11 January 2019 (41:20). ↑ 68.0 68.1 Interview, 17 August 2018 (8:16). ↑ 69.0 69.1 Livestream, 11 January 2019 (58:40). ↑ 70.0 70.1 70.2 Reddit Q&A, 8 January 2019. ↑ 71.0 71.1 71.2 71.3 71.4 Livestream, 30 June 2017 (26:47). ↑ PAX West 2017 Ranger poster. ↑ 74.0 74.1 74.2 Livestream, 16 October 2017 (45:21). ↑ PAX West 2017 Tank poster. ↑ PAX West 2017 Mage poster. ↑ PAX West 2017 Cleric poster. ↑ 79.0 79.1 Livestream, 18 January 2018 (22:46). ↑ 82.0 82.1 82.2 82.3 Livestream, 8 April 2018 (PM) (55:49). ↑ 83.0 83.1 Livestream, 9 July 2018 (25:34). ↑ 86.0 86.1 Livestream, 17 November 2017 (22:33). ↑ 87.0 87.1 Livestream, 17 November 2017 (56:07). ↑ 90.0 90.1 90.2 Livestream, 26 May 2017 (19:51). ↑ 97.0 97.1 97.2 2018-12-08 Newsletter. ↑ 98.0 98.1 Livestream, 6 December 2018 (28:45). ↑ 100.0 100.1 100.2 Livestream, 6 December 2018 (26:12).